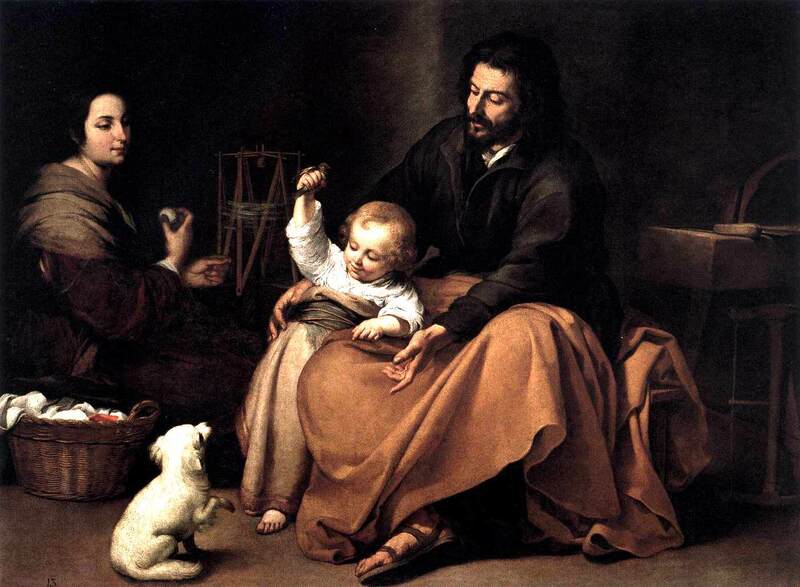 “The Holy Family with the Little Bird,” by Bartholome Esteban Murillo, linked from WikiPaintings. In today’s Gospel, after the harrowing experience of losing her son while away from home, we are told, as has been pointed out in other Gospels, that Mary kept or pondered all of these things in her heart. Most family members have had occasion to ponder in their hearts and to hold in prayer what is happening in their own family. What is best for my child in this situation? How can I help my parents who are growing older? How will this new job or this move affect my family? How can we reconcile our differences? Will they forgive me? What shall I do if I think my spouse or child is making a huge mistake? Often, it is wise to take some time to ponder and to pray rather than reacting to a situation immediately. Taking a step back, taking time to breathe, contemplating the many aspects of an event or encounter, asking God to give us wisdom and insight, can help us to respond from our best self in a Christian and compassionate manner. Mary surely had many questions and concerns. Jesus was often a surprise to her and to Joseph. Her relationship with God and her willingness to ponder, no doubt helped her to be the mother she wanted to be. Loving God, we thank you for the example of Mary, who through contemplation, embraced God’s will for her life and her relationships. We thank you for our families, and pray that in the challenges of family relationships and decision-making, we may often slow down and step back to pray and reflect before reacting. Bless our parents, children, grand-children, extended families, and all who have been family to us over the years. Bless our human family and the family of all creation who inhabits our planet Earth. May we learn to love one another, to live at peace with one another and to consider one another’s needs when we choose to act. We ask this through our brother Jesus. Amen. Joseph held his responsibility for protecting the newborn child and his mother at the top of his priorities. He watched them carefully, was glad when they found lodging soon after the census was taken. A little carpentry work took care of the cost of food and housing, so he was content. Then came the dream. Herod was looking for them and they were to go immediately into Egypt to keep the child safe. Joseph went to Mary as she slept and roused her. After explaining what had happened, the two of the gathered what they would need for the journey. The distance from Bethlehem to Egypt was more than 300 miles. Walking and with only a donkey to carry what they needed, the trip was formidable. I would think Joseph kept looking over his shoulder in his anguish to think someone would want to hurt Jesus. When they finally came to Egypt their relief allowed them to rest more easily. They talked about the visit of the Wise Men, and how welcome their gifts were now. They settled down, and lived there for many months. In the Boston Museum of Fine Arts, there was a painting entitled the “Rest on the Flight into Egypt.” It showed the Sphinx in all its grandeur. Mary had climbed up to the arm of the sculpture, and was asleep. The child Jesus held firmly on her lap by the shawl she was wearing. Joseph slept too, but a short way from the Sphinx, with his walking stick nearby. Lying completely prostrate his worry and fatigue was obvious. They were out of Herod’s clutches, and he could relax. The Sphinx had a gentle smile on his face. For me that smile spoke volumes. Jesus is here for all peoples and all are asked to protect him from harm in the persons they meet every day. Jesus is alive in each of us. If you think you cannot see him in someone, that person needs your special care and concern. Do everything you can so salvage the life of Jesus in that person. Pray especially for people on death row who are waiting for someone to put them to death. Others are dealing with the death of children unable to understand how or why. Most do not have a protector like Joseph. 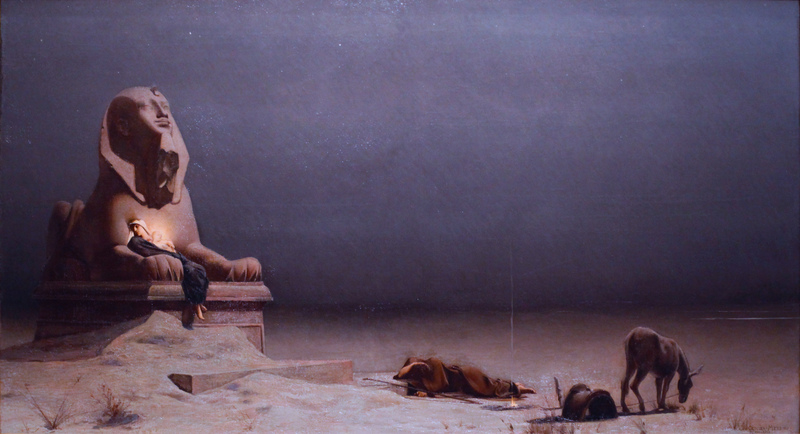 We, who are sheltered, must be like the sphinx, and offer a place of comfort, unknown to anyone else but God. Joseph and Mary have arrived in Bethlehem. Immediately Joseph begins looking for shelter for Mary, who recognizes that the Holy Babe will arrive very soon. How he must have felt. Here he was, entrusted with the care of the Mother and the Baby from heaven and he could not even insure a roof over their heads! His heart wrung with pain at having failed to provide as a father is destined to do, Joseph must have not even felt a glimmer of hope when a kindly innkeeper, after announcing there was no room, told him of a stable, a cave nearby where they would at least have some privacy. Joseph led the donkey, carrying its precious load, to the stable. Hastily Joseph prepared a makeshift reclining place for Mary, using straw stored in the stable. As Mary reclined, Joseph looked for a place to put the Baby, the Messiah, the King to be born. Mary would need to rest and the baby would need a place to sleep. The only safe place would be the feeding trough, the manger left to feed the animals usually stalled there. But could he put the Son of God in an animal’s feeder? Reluctantly he filled the manger with straw, which he crushed to make it softer, and laid the cloth Mary had prepared for the birth. And as Joseph wiped away a tear, the cry of a newborn baby broke the stillness. “He is here! Mary? !” She smiled as Joseph took the baby boy in his hands and laid Him in the place he had so recently prepared. Little heed was paid to the trough. Only the Child mattered. And Joseph had his answer. He knew what he could do. He could be Protector, Guide, and Father. And his heart sang as it had never sung before. If you ever feel inadequate for the task put before you, if you thought it was impossible for you to do, pray to St. Joseph. He knows what that feels like. And what you had to do was certainly not as earth shaking as what Joseph was assigned to do. Maybe if we look at the Christmas crib, we will be able to see more than the sweet picture put before us. Perhaps we can see the pathos of Joseph, as he prepared a feeding trough in which to lay the Son of God! May we note how Jesus did become food for us all! I believe the lowly stable and trough, however, made it easier for the poor shepherds to approach, when they were the first to see the Newborn King. How can we make it easier for the poor, the lonely, and the despised, to approach us? Do we even try to approach them? Moreover, do we see the ordinary things of life as stepping-stones to eternity? It is just little more than a week before Mary is to give birth. She has prepared all the necessities for the trip and Joseph has procured a donkey so that Mary might ride. After the food and other material things they would need are strapped to the donkey’s back, they move on their way. Several families are going to Bethlehem, so there is some chatter among them. A few are loudly upset about having to go that distance. Some are looking forward to seeing relatives there. Mary and Joseph quietly ponder the birth that is imminent. It is a four-day trip on foot. They would rest each evening; share a sparse meal and rest. Joseph was concerned about Mary. The trip was not easy and she was most certainly in much discomfort. However, not a word of complaint left her lips. In fact, her peaceful smile warmed his heart. In this way, they passed three days. On the fourth day, they entered Bethlehem. They stopped to view Bethlehem; the place indicated by the scriptures that the Messiah would be born. Mary praised God for bringing them safely here. Travel can be very enjoyable. But there are those times when everything seems to go wrong. Planes are late or overbooked. You are asked to give up your place on the plane for other “more important” passengers. That is not said, of course, but… Your luggage is in Chicago and you are in Dallas Texas. It is close to midnight and the people who were to pick you up left a number where you can reach them when you get in. You in the meantime, are in a heated or air-conditioned building, with coffee or ice cream machines. You do not need to sit on the ground since there are comfortable seats. Compare this to the trip made by the couple chosen by God to be the most important on earth! Sometimes it is hard to put things in perspective. I think this happens more frequently at holiday times. When we are safe and warm and just waiting for “rescue” from annoying things, we sometimes make the insect a dragon! Now is especially the time to practice patience, at home, with friends, while shopping or traveling. It isn’t easy! But if you close your eyes for a second and think of those two people with a THIRD on the way, you may be able to put things in perspective. Say “Merry Christmas” whenever you are stressed. It helps keep things in perspective at this time of year. Say it to everyone and smile. The King of Kings is about to be born! While Mary went about her work as wife and soon-to-be-mother, the bell in the town square began to ring. That meant something very important was happening. It might be a fire, or some other disaster. Everyone would go to the calling bell to see what needed immediate attention. This time it was a message from the Emperor. All citizens were to go to the place of their birth to be counted for taxes. Not questioning, not complaining, Mary set about doing what she could do. This message was not in her plan for preparing for Jesus’ birth. Perhaps she drew on her knowledge of Scripture that Messiah was to be born in Bethlehem, and marveled at how God’s plan comes about through varied ways. This time it was an edict from the emperor that would put her in Bethlehem, a place she had not planned to be. Mary began planning what she would need to take on that journey. It would take overnights, so she would make arrangements to join with others . She must prepare food, things that she and Joseph would need, and of course, swaddling clothes for the baby, who would be born very soon. I don’t know about you, but getting an order to move from someone higher on the social scale would not set well with me. The thing to be kept in mind is that Mary had no influence against this decree. She simply had to take what was stated because there was no way out. Things like that happen to us all the time. We pout about a rainy day. Or we become angry because a spouse or child must work, and we want them to babysit, or drive us somewhere. Mary doesn’t react this way. She just begins to make the plans that the interruption in her life demands. What kinds of things happen that can upset you? At this time of the year it may be that you run out of scotch tape, or sugar. Gift wrapping and cookie making must be halted a bit. More distressful, you have guests coming for dinner and the stove goes POUFF! and no more stove. Or your child becomes ill just before the Christmas play and he was to be a King! with a Crown! and a red robe! How do we handle those things? At eight months pregnant Mary is about to begin a journey of 80 miles on foot or on a donkey part of the way. No complaining from her, just preparations for that awesome journey. Business people would probably have a plan B. That is all well and good, but even then, something can happen to throw things askew. Try to keep a calm demeanor as we come closer to Christmas. Give yourself time to ponder and reflect, as Mary did. Jesus is coming! God, source of love and joy, help me in my search for real love in my life, love that does not depend on the presents I receive but on the times I help and make others happy. Only then will I have true joy in my heart. Amen.